Special, Nature, Hudson River, Conservation -- The Clearwater - Are We There Yet? I've personally had the pleasure of seeing every major river in this country, most from several vantage points, and I can say without reservation that none can match the Hudson for its beauty and majesty. Happily, the Hudson is in better shape now than it's been for a while. Fish are beginning to return. The River looks better. Forty years ago it was a dumping ground for untreated sewage and toxins like PCBs for companies like General Electric. In 1966, a handful of river-lovers decided to face this challenge: to change the course of events that was destroying the Hudson, and reclaim this national treasure for us all. They wanted to provide their fellow citizens with a first hand look at the pollution, and move them to action. The Clearwater was born. Launched in 1969, the classic sloop has since traveled to towns and cities along the Hudson, New York Harbor and Long Island Sound, bringing a message of care for the environment. Each year thousands of children and adults board the Clearwater to explore the natural history of their local region. They help to hoist the sails and steer the boat, but more importantly, they examine fish and water samples for a first hand view of what is happening to the waterways -- and learn what can be done about it. Individuals and families may become members ($40 and $55 per year). This modest fee brings more than the satisfaction of supporting effective care for the environment. The Navigator, the Clearwater's publication, keeps members informed of festivals, public sails, special events, and environmental action. As part owners of the sloop, members will also have the opportunity to participate in three-hour Member Sails, or become a volunteer crew member for a week. With public education a primary tool for fostering ecological health, the Clearwater's school and group programs are among the best available. The Classroom of the Waves is a hands-on educational experience aboard the Clearwater. Group Sails are conducted for school and adult groups, and all take part in catching and studying specimens, learning about the river and its life forms, as well as sailing, navigation, and a variety of other activities. Students rotate through study stations in small groups and are closely supervised. Sailing time is about 3 hours. Programs for schools and youth groups tend to be more formally structured than adult and family programs, and all are adaptable to a wide range of needs. Maximum passenger capacity is 50. All group sails are arranged by written application. There are application deadlines, and further information can be obtained from the Official Website or by calling. Cost for school or youth groups is $1,250.00 for a three-hour sail. Not-for-profit adult groups pay $2,000.00. For-profit groups pay $3,000.00. For a five-hour sail the fees are doubled. These programs cost $200 per class, with a $50.00 surcharge per additional class. Note that a travel surcharge may apply for schools outside of the Poughkeepsie area. Special Programs cost $500.00 - $770.00 per class. Most programs can be tailored to a group's specific needs. Call for details, or visit the Clearwater's official website (linked above) program descriptions. Three-hour Public Sails are offered, dedparting from docks alaong the Hudson, from Albany to New York City. 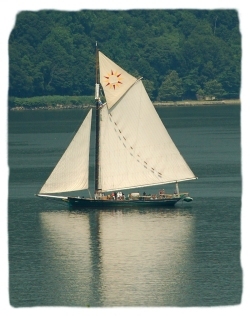 Participants will learn about sailing, the Hudson, and our ecology. The cost is $50.00 per adult ($35 for members) and $15.00 per child 12 or younger. Reservations are required, and a calendar of sail dates is available at the official website. All prices and other information are subject to change without notice. See the Clearwater's website for the latest info. Teacher workshops, and a large library of resources and equipment are available for educators. Call for complete details.